This adventure path plug-in for any pirate-themed campaign/module clocks in at 32 pages, 1 page front cover, 1 page editorial, 2 pages introduction/how to use, 1 page ToC, 1 page SRD, 2 pages of advertisement, 1 page back cover, leaving us with 23 pages of content, so let’s take a look, shall we? So the first question you may have is: What does distinguish this from Legendary Games’ Pirate Codex? The answer is pretty simple – the Pirate Codex is all about sample NPCs/statblocks – this book is about NPCs with an emphasis on the “C,” i.e. the character component. Beyond that, this is pretty much a collection of NPCs that will prove a godsend to especially groups with less participating players – the collection of NPCs herein covers the roles that some of your players potentially don’t want to cover: No motivation to cover the siege engines? Hire the feisty dwarven maid Jenna Ironflame, one of the last scions of the elite dwarven clan and you’ll see how deadly siege weapons can be! Need a capable first mate? Lachlan Chardet, a fighter (cad)/rogue (pirate, scout) is not only an interesting build with both multiclassing and extensive templating, he’s also more than up to the task! Need a ship’s mage? What about Mayjen, the crossblooded gnome sorceror? Or do you need a good lookout? A total of +12 in Perception for a 4th level fighter/oracle multiclass is certainly efficient and up to the task. Perhaps you are looking for some diversity – so what about adding a tengu cleric (separatist) as the ship’s surgeon with Rukaia? A great sea-singer bard to keep up the morale, a changeling druid as the ship’s mate or a bard (buccaneer)/fighter (weapon master) captain as well as a rogue (swashbuckler) carpenter and a half-orc boatswain (ranger with the freebooter archetype) all are in here, each NPC sporting a compelling little background story – obviously potentially also making for an alternate crew to pit against the PCs, should you choose to – of course, you could also use these NPCs as cohorts for higher level NPCs to take the naval combat completely out of their hands regarding the rolls. Now, so far I’ve covered the “crew” aspect, but that would only be the first part of this pdf – the second covers the cutthroats and, if the moniker wasn’t ample clue, these guys and gals are not to be trifled with -an array of dangerous villains, if you will. First among these nefarious beings would be an oracle that comes fully detailed with a nasty grimoire of dark magics, including preparation rituals and read-aloud text depicting it. Oh, have I mentioned the nice synergy with the Islands of Plunder-series? Fans of Razor Coast especially will definitely appreciate the hobgoblin barbarian wereshark (scarred rager) and his megalodon mount as well as his wereshark henchmen riding hammerheads -all fully statted, mind you. And jup, wereshark shaman? Covered. Here I was thinking I’d one day get tired of weresharks. No, still awesome – especially when riding HAMMERHEAD SHARKS AND MEGALODONS. Come on, you have to love this! And yes, I will use one template or another to make the sharks shoot lasers from their eyes. Why? Because I can. Editing and formatting are top-notch, I noticed no glitches. Layout adheres to Legendary Games’ two-column full-color standard for Skull and Shackles plug-ins and the pdf comes with an array of artworks, some of them new, some reused from previous LG books. The pdf comes fully bookmarked for your convenience and with the good type of hyperlinks to d20pfsrd.com for the more complex/unusual of rules. Matt Goodall and Jason Nelson deliver big time – I absolutely adore this cool NPC collection -while specialized and unique, nothing keeps you from using the NPCs herein as templates for characters to use in your game. The nice thing about them, though, would be that they feel right – while optimized to a certain extent to fit their tasks, the NPCs herein do sport those nice, small tidbits that usually only develop from the quirks of players – you know, the hyper-optimized character who has a couple of ranks in Craft (glassblowing) – while the characters herein obviously aren’t that on the min-maxy side, this extreme example should illustrate what I’m trying to get at – the characters feel organic and the level of detail provided is ultimately nice, fun and captivating. 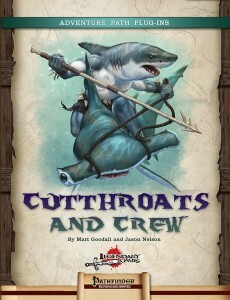 My one gripe with this pdf is that, personally, I would have loved one pdf for crew members, one for cutthroats – more villains, more crewmembers. As provided, I felt myself wishing there were more adversaries, more of these well-crafted crew-members to choose from – though, obviously, clamoring for more is a pretty good sign in my book. Ultimately, this pdf delivers all it promises and more – and is well worth a final verdict of 5 stars. You can get these characters here on OBS and here on d20pfsrd.com’s shop!